As a tester, I used to tell people that I could go into any field and I’d be able to test their software, and for a long time I believed it. That is, until I went to work for a company with a product that was heavily dependent on physics and physical phenomena, which was not my strong suit. I learned from that experience that domain knowledge is vital, and while you can fake knowing some things, or quickly pick it up as you go, there’s some stuff you just can’t fake. Physics is one of them. Biochemistry is definitely another. It’s just not something you can casually pick up on the job, you really have to spend some time with it and come to grips with the world of biological interactions and the cross section of biology and chemistry. 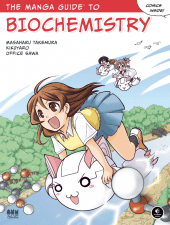 For a minimal pain related approach, The Manga Guide to Biochemistry is a wonderful way to get that fundamental domain knowledge. NoStarch has gamely taken on publishing “The Manga Guide to…” series of books in English, and for those of us who are proudly Otaku in our general interests, to have Manga volumes dedicated to some of the headiest technical topics in the sciences is pretty awesome. Make no mistake, these books do not dumb down the topics, but they do use the conventions of Manga to illustrate topics in the classic ways that have endeared generations of Otaku to Manga. The silly drawings, the subtle fan service, the inside jokes, the goofy drawing styles to show stress, pain, embarrassment and joy help keep the reader engaged and entertained as they go through what is, seriously, a challenging topic to digest. It’s a true testament to the effectiveness of the Manga Guide series that they are able to tackle these subjects so effectively time after time. The Manga Guide to Biochemistry starts at the beginning, and walks the reader through the basics of cellular structures. It then moves into the chemical structure of cells, the methods of nutrient absorption, and the chemical reactions and the mathematical models to understand and interpret the results of experiments. these experiments range over topics like respiration, metabolism, photosynthesis, lipid absorption, breaking down of saccharides, and amino acid construction and even protein folding. There are two levels to these books. The first is the actual Manga story. We follow the daily adventure of a high school girl named Kumi obsessed with dieting, and her friend Nemoto hoping to get her to see beyond her obsession by teaching her about biochemistry. Aided by his biochemistry professor, Kurosaka (who also see that Nemoto is completely smitten with Kumio and decides to play matchmaker… hey, this is a Manga after all 😉 ), Nemoto help Kumi understand the complex interactions inside of her body between lipids, saccharides, amino acids, cholesterol and enzymes and how they work and are constructed/deconstructed on a physical level). The second level branches into more in-depth discussions and study of how these processes actually happen. There may come a time when you will want to explore this topic, whether as an introductory text to get your heads around it, or maybe even to give a first glimpse into what working in biotech might entail. While I cannot say this would be the only reference you will ever need (not even close), I can say that it will go a long way towards de-mystifying the subject and give you a lot of good tools to reason through. It will also give you a better understanding of how biochemistry happens inside of living organisms and how we can make use of that information and approach towards constructing tests to address that phenomenon. Yes it is “so kawaii” (meaning “so cute”) but don’t let that deter you. There’s a lot of meat here to digest (pardon the pun) and this is a fun way to consume and digest it.